Republic Services, Inc. and Mas Energy, LLC unveiled today a new renewable energy project serving Metro Atlanta. The innovative project involves landfill gas-to-energy facilities at three area landfills, located in the cities of Buford, Griffin and Winder. Together, these facilities are capable of generating 24.1 megawatts of electricity, or enough renewable energy to power 15,665 households. "We believe in leading by example in everything we do," said Jamey Amick, area president of Republic Services. "The modern landfill presents new opportunity to harness energy from yesterday's waste and convert it to meet tomorrow's energy needs. We are proud to partner once again with Mas Energy to generate a renewable energy source that makes a meaningful and lasting environmental difference in the state of Georgia." Landfill gas-to-energy projects like these involve capturing methane, a byproduct of the normal decomposition of waste, from the subsurface and routing the methane to a series of engines. These engines convert the methane into electricity, which can be distributed to the local power grid. According to the U.S. Environmental Protection Agency (EPA), 3 mW of renewable energy generated by landfill gas-to-energy projects is equal to preventing the carbon emissions emitted by the use 16.6 million gallons of gasoline. Based upon EPA calculations, this project prevents carbon emissions that would otherwise be emitted by the use of more than 132 million gallons of gasoline. Republic is dedicated to maintaining a balance between its business operations and protecting the environment and communities it serves. Known as the Blue Planet™ sustainability initiative, Republic has defined its approach to environmental responsibility through decreased vehicle emissions, innovative landfill technologies, use of renewable energy, community engagement and employee growth opportunities. 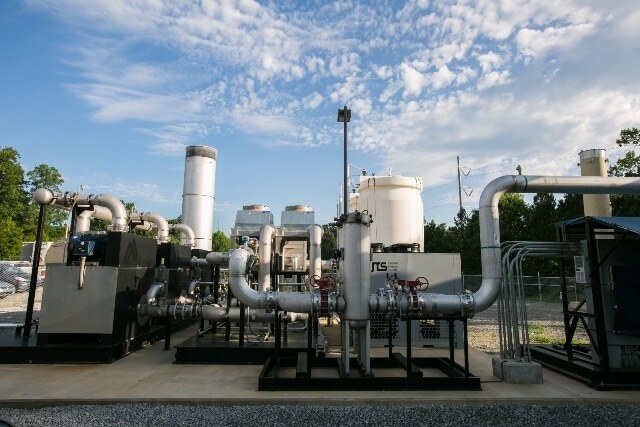 Nationwide, Republic Services companies send landfill gas to 69 landfill gas-to-energy projects, which taken together generate enough renewable energy to power more than 250,000 homes, or every household in the city of Atlanta. Other partners participating in Republic and Mas Energy's latest renewable energy project include Georgia Power, I Squared Capital, Crowder Construction Company and Nixon Energy.